Vinyl decal enthusiasts rejoice: A few little stickers could turn into big business. StickerGiant went from printing a few thousand stickers in the founder’s basement to an $8 million business with 30,000 clients — including NASA and Google. For a custom window sign printer, that’s good news. But for a consumer, it’s even better. The meteoric rise of window decals and stickers means you have more options than ever to find the vinyl decal printer that will customize your designs and help make your branding a reality. 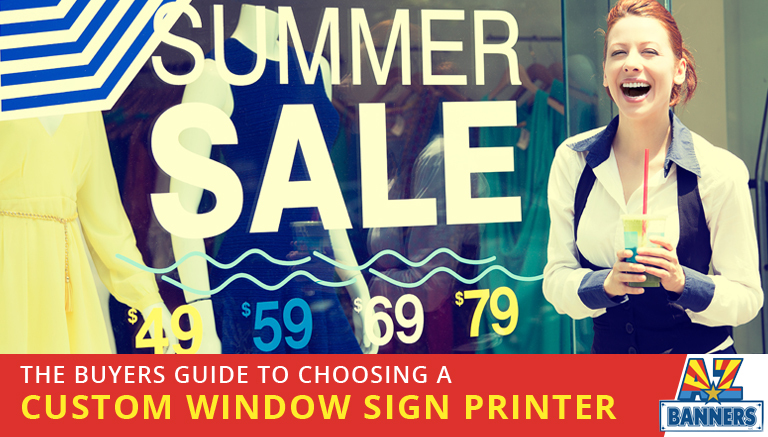 Here’s how to find the best custom window sign printer. When you need decals, it’s best to start your search for a custom window sign printer with an idea of your ideal product in mind. Do you prefer a large retailer with online options or a locally owned store that will give you a great deal? Do you need someone to provide vinyl graphic designs, or will you have your own decal in mind? When do you need your order completed, and how much communication with customer service do you prefer? Make a list of your must-haves, such as an on-site graphic designer or a certain turnaround time. Knowledge is power when searching for the best vinyl decal printer for you. Pick a company with quality and quick service that’s known for a hands-on approach with their customers. Word of mouth is a stellar way to find out your options for custom window sign printers. You can also do an online search, or check a reputable review site such as Yelp. If you’ve found a company online, make sure you read testimonials and reviews. Reputation is everything for good businesses, so don’t be afraid to request to work directly with upper management or the owner. At AZ Banners, for example, our owner Bill interfaces directly with clients from all over the world and takes pride in his hands-on approach. We want you to have the best vinyl decals out there! A vinyl decal printer should be able to give you an accurate timeline for completion of your order. Work directly with the staff to find the best turnaround time for you. Anyone you work with should have the capability for rapid bulk orders once you have the design finalized and your materials chosen. If you’re making a large or complicated order, make sure the company you work with has appropriate printers and machinery. Don’t pay exorbitant fees for high-quality materials, multi-colored designs, or quick delivery. You should be charged a fair price for your order, and don’t be afraid to get multiple quotes from several companies. Customization or rush orders might cost a small premium, but high-quality vinyl signage and decals shouldn’t break the bank! Now that you know what kind of company you want to work with, reach out to them to get your order started. And when you need decals made well and fast, don’t forget AZ Banners — the fastest signs in the west! Click here to let us be your custom window sign printer. We’re looking forward to working with you! Are you searching for a top-rated printer to deliver quality, eye catching window signs or decals? The experts at AZ Banners create custom window signs, banners, and more to help you get noticed. You will love our attention to detail and fast turnaround times! Get in touch with us today to learn how we can help. Request a quote online or call 480-458-8128!